As part of our regular back to basics series, last week, we talked about problem-solving in the workplace. This week, we’d like to expand on that and talk a bit about decision-making skills that you’ll need as a small business owner. 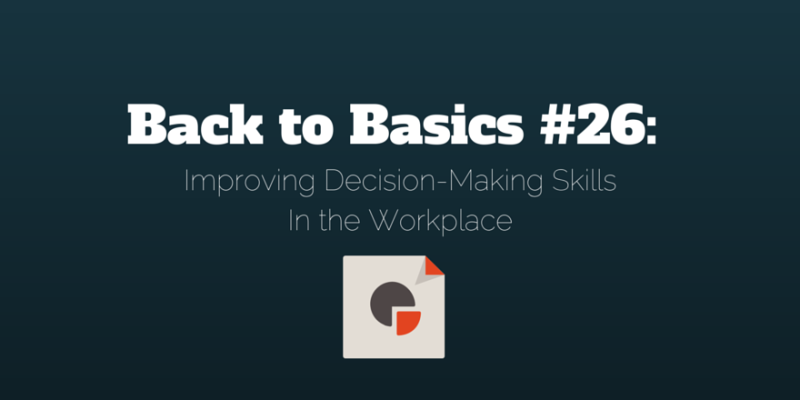 Being able to make sound decisions for yourself and for your employees is a skill you can’t afford to neglect. Your company depends on you to make informed, sound decisions without a long delay. It’s a tough prospect to consider for some people, because while some thrive on confronting challenging issues regularly, there are many out there who don’t enjoy this kind of stress. In fact, they would prefer to run away from it as quickly as possible! Unfortunately, though, there’s no way around tough decision making. You’ll have to do it at some point or another, so you might as well get used to it. While that might sound like tough love, we do have some good news: We guarantee that you can learn how to be a better decision maker and feel confident in your decision-making skills. When trying to make sound decisions, there are a few things that you’ll want to keep in mind: you’ll want to be objective, think of multiple solutions, and figure out how you can delegate the decision making process. It’s easy to run into a stressful situation head-on, feeling furious, frustrated, or confused. But that’s no way to approach making major decisions. You’ll need to clear your head and focus on the task at hand before you tackle it. In this situation, you’d be making decisions based on subjective reasons (emotional), rather than objective (logical). Objective reasoning considers everyone in the office (or at least everyone involved with or affected by the decision) before the decision is made. It is a choice made rationally, without heavy or negative emotions influencing the outcome. It’s easy to see why this would be important—it takes the team into consideration, rather than just the decision maker. If you try this method, but still find yourself unable to make an objective decision, you can always enlist the help of trusted colleagues, or you can try backing off for a while (time permitting) to see if your head clears up a bit. You might also try brainstorming or writing down scenarios that you would like to have come to fruition. Then you can choose the best option from these solutions. Am I making this decision while feeling sad, angry, or frustrated? Am I making this decision to benefit myself over others? Am I making this decision to benefit some of my staff over others? How would this reflect on me as a boss? Will my company employees respect me for this choice? 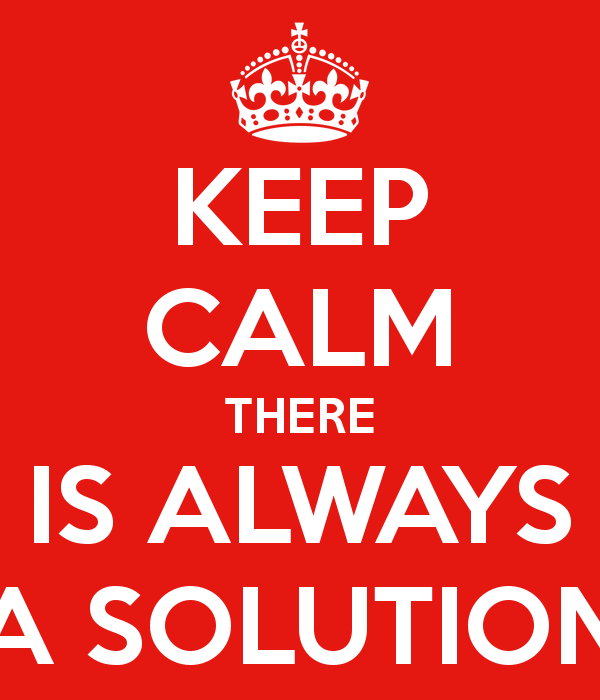 Sometimes, it’s difficult to come up with the correct solution because of budget constraints or conflicting interest. Other times it seems like there might actually be more than one correct solution because of the complexity of the situation. In these cases, it might help to brainstorm a bit and come up with a few ways you could move forward. For example, could the problem be solved by asking multiple people to complete a difficult task? Would it be helpful to move people between departments? Perhaps it’s best if you hire an extra person to take care of loose ends. If it’s a temporary issue, you could always consider an intern or assistant. There are a number or ways you can approach an issue, and if you take the time to consider all of them (or at least as many as you can think of), you’ll be able to make the best decision possible. Alternatively, if your problems are rooted in the motivation, attitude, or productivity department, you might want to try a survey. You can ask your employees what would make work better for them. Perhaps they’re sitting in a dreary spot in the office and could do with a bit more natural light. Perhaps they’re feeling unmotivated because the office never has any fun activities or a good break area. Simply by talking to them, you can come up with a few solutions and then ask your employees for feedback on your ideas. If you get a majority supporting one idea in particular, you’ll know which decision to make! Brainstorming doesn’t mean coming up with complete strategies. It means thinking of different ways of approaching a problem. You can do this, no matter how good or bad the ideas seem at the moment. Just get your brain thinking! Are there ways to make your budget stretch further? For example, if you’re considering hiring another person but don’t know if you truly have the budget for it, are there other costs you could cut? By adding an extra sum of cash into the equation, you have more opportunity for more varied solutions. Are there creative ways you can approach this problem? Is this problem worth addressing quickly? Or is it something that can be implemented step-by-step? Sometimes it’s tough to make a decision all on your own. It’s necessary at these times to find someone you trust—a creative partner, your assistant, another manager—who you can bounce ideas off of. Remember, when you make decisions, you can always ask for feedback before deciding on anything permanent. There is nothing wrong with asking for help. In fact, your decision might be improved upon when you take another point of view into consideration, and the results of your decision could be even be better than you would have anticipated otherwise. To start, make a list of the people you can trust to advise you. After all, kings and queens of the past had advisers for a reason! The president has advisers for a reason! 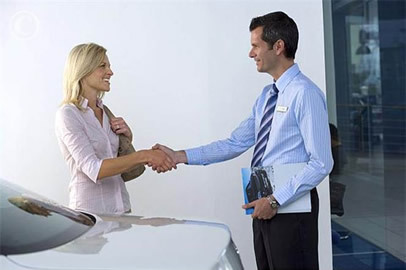 You, as a small business owner, can also improve your chances of success by having trusted advisers. Is this a problem that involves a specific complaint, such as discrimination, harassment, etc? Is there someone I can talk to about this before making a decision based on my judgments? Is this a problem that could be solved creatively? Is there someone who I can work with to come up with a solution I might not have thought of? Is this a problem I can easily solve by asking my employees what they need? Can I design a quick survey or arrange a meeting to hear their thoughts and suggestions? In summary, the most important and helpful tips for improving your decision-making skills are: remembering to remain objective about your decision, thinking of multiple solutions to a problem, and asking for help where it’s needed. If you practice these tips, you’ll soon see that you’re making better decisions faster and more easily. Good luck! 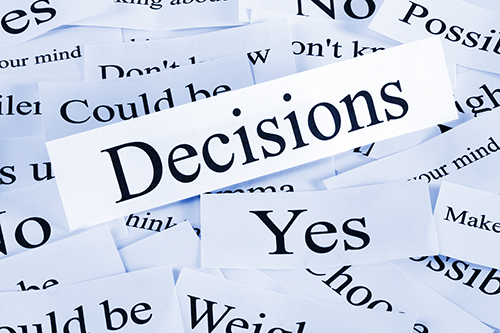 Can you think of any other ways to make better decisions? Let us know in the comments!